Why do Oklahoma family farmers and ranchers need the protections of State Question 777? Because of legislators like Rep. Brian Renegar. The southeast Oklahoma representative not only voted for the measure at the state Capitol, but also spoke publicly in favor of the bill before a group of Oklahoma Farm Bureau members and in a local newspaper article. 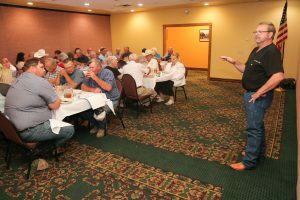 Rep. Brian Renegar speaks in support of SQ 777 before a group of Oklahoma Farm Bureau members in 2015. Renegar even ran a bill to prevent animal rights groups from raising funds in Oklahoma, was sued by Drew Edmondson and the Humane Society of the United States, and stood on the House floor asking for support against the group from his peers. But now – late in the SQ 777 campaign – Renegar has decided he opposes Oklahoma’s Right to Farm. Have Drew Edmondson and his cohorts at the Humane Society of the United States managed to buy him off? The legislator claims animal rights groups have no weight at the state Capitol; yet, Renegar himself has authored several bills backed by animal rights groups including HB 2764, SB 1729 and HB 2766. It seems Renegar cannot decide who he supports or where he stands. Protect Oklahoma family farmers and ranchers from bought-and-paid-for legislators like Renegar by voting YES on State Question 777.